The new trading week commenced with — what else — additional gains in already overheated metals markets. Falling oil and rising dollar values had little impact on opening bids in gold and the rest of the precious metals’ complex. Today’s momentum was all about… momentum. New highs in gold came in at $1,604 overnight and the metal is still possibly poised for the $1,615 – $1,630 "overshoot" being alluded to in Friday’s late afternoon EW update. Ten consecutive sessions of gains in the yellow metal (from the July 1st low at $1,478.00) have yielded a market replete with 95% stampeding bulls (only 3% shy of the previous extreme around May 1st) and all of them are shaking the market’s floor in expectations of debt doomsday. 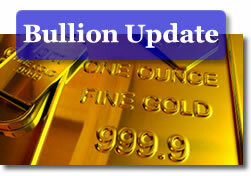 Bullion opened at $1,600.20 on the bid-side, with a gain of $6.10 the ounce. Silver tacked on another $1+ for good measure, opening at $40.29 per ounce in New York. The breach of $39.77 opens up the possibility of the white metal’s trek to a range of from $43.18 to $43.86 and pushes the bear case back to a required close under the $35.70 mark. As with gold, the mega-rally in silver has been built on the putatively imminent default by the US. Questions have begun to appear as to when the exchanges might once again raise margin requirements for gambling in the white metal. Veteran market analyst Ned Schmidt reminded his many Value View Gold Report readers over the weekend that silver "is being pushed higher by speculative funds in North America. The rise in Silver is not due to some vast horde of investors in Asia buying Silver. Individual cash buyers of metals are not as gullible as Wall Street. Silver continues to trade at a price in excess of a reasonable level due to the "impending default" of the U.S. Should that default not occur, the price of Silver will be extremely vulnerable. As Mr. Schmidt sees it, "silver continues to trade at a price that should be used to convert physical Silver into money that can be spent. Take the money, and go to Las Vegas. In sum, we need to remember that the action in Gold and Silver these past few weeks is again dominated by speculative funds active in the futures markets. Every time that is happened in the past investors have ultimately been disappointed. The collapse of Silver is a good example of what can happen. Be wary whenever speculative funds are overly active in futures!" As we see it, Mr. Schmidt will take a lot of "incoming" for expressing such "heretical" views at this juncture; par for the course, for any "reality-based" contrarian, and that’s not mere… speculation. Speculators returned to the commodities’ complex in a big hurry and in a big way last week, as the rolling European debt crisis and the stalling US debt ceiling talks prompted a quest for alternative holdings. On the other hand, so much of the large gains that the markets have witnessed over the past two weeks has been predicated on two basically unlikely events (the demise of the EU and its currency and the default of the US) that any resolution on either front could spark serious scrambles for the exit doors by the same players at any moment. Platinum and palladium started Monday’s session with modest gains ($3 and $1) but later amplified on the trend and climbed to $1,781.00 and to $796.00 respectively (on the offer side of spot) as waves of buying rolled through the market in mid-morning trade. In the background, the Dow sank 148 points while the US dollar rose 0.50 on the index. European equities also shed value in the wake of Friday’s EU-wide bank "stress test" that evidently stressed out investors in such shares. Eight banks did not get a passing grade on the aforementioned test and albeit the number was half of what had been anticipated, the markets continue to perceive that more needs to be done by the EU to allay concerns. Said markets will now have to wait another three days before EU officials meet and try to tackle the sticky issues facing the region. As of this morning however, at least as regards crude oil, the perceptions were a tad..different (make that: more reality-based). Black gold fell $2 despite gold’s touching of the $1,600.00 mark overnight, and despite the still-evident need for shelter from debt-related crises of various stripes my market players. Evidently, oil market participants understand the fact that the equation default = soaring commodities + collapsing dollar is not the only acceptable one in the market’s math. The more "realistic" alternative development is that default = collapse in all imported goods + a revaluation of ALL assets (oil and gold included). One school of thought calculates that in the event of a US default the demand for crude might contract by as much as 20 to 40 percent. Another theory is that as imports crater, the ‘export’ of dollars mounts exponentially, and that it leads to a shortage of greenbacks that would send values soaring (no need to mention what that might do to gold and silver prices…). On the pesky issue of the debt ceiling/ debt crisis, it turns out that all of the noise being made in Washington by the two political parties involved are being met with a major ‘frown‘ by the American public. Among them, the GOP is faring the worst, with about 71% of the US public being displeased by that party’s ‘handling’ of matters (i.e. the tax and spending issues on which it won’t budge). NY Times columnist Paul Krugman noted in a weekend op-ed piece that "President Obama has made it clear that he’s willing to sign on to a deficit-reduction deal that consists overwhelmingly of spending cuts, and includes draconian cuts in key social programs, up to and including a rise in the age of Medicare eligibility. These are extraordinary concessions. As The Times’ Nate Silver points out, the president has offered deals that are far to the right of what the average American voter prefers — in fact, if anything, they’re a bit to the right of what the average Republican voter prefers! Yet Republicans are saying no. Indeed, they’re threatening to force a U.S. default, and create an economic crisis, unless they get a completely one-sided deal. And this was entirely predictable." Mr. Krugman’s central GOP-oriented accusation is not so much the recalcitrance being exhibited by folks such as Messrs. McConnell and/or Boehner; it is the practice of voodoo economics that really irks him. Notes Mr. Krugman: "Supply-side voodoo — which claims that tax cuts pay for themselves and/or that any rise in taxes would lead to economic collapse — has been a powerful force within the G.O.P. ever since Ronald Reagan embraced the concept of the Laffer curve. But the voodoo used to be contained. Reagan himself enacted significant tax increases, offsetting to a considerable extent his initial cuts." President Obama apparently go ‘high marks’ from the aforementioned polled public; "high" in this case meaning that 48% of folks were unhappy with his actions while 43% were not. The clincher (and a possible preview of coming "attractions"): 66% of the public polled believes that August 2nd will not roll around without an a priori agreement being reached on the debt issues. With that in mind, it might simply be safer to just count the days out until July 21 (the EU summit) and until the end of August 1st (you-know-why) before coming to certain…conclusions.